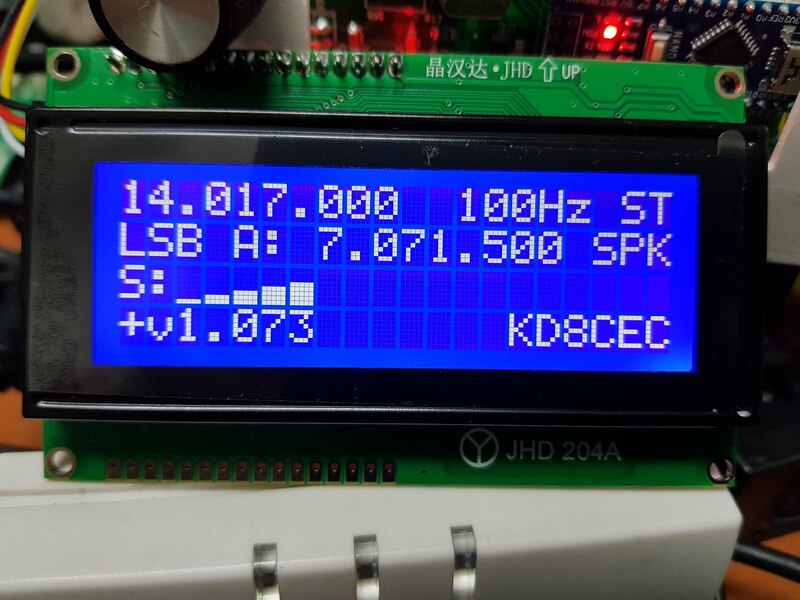 Since uBITX Firmware CEC Version 1.073 Beta, it supports 4 + 1 kinds of LCD. Of course all basic firmware tests are based on the factory default uBITX, which has not been modified. Up to uBITX Firmware CEC Version 1.61, I aimed at basic and stable firmware. Still, I think Version 1.61 is the most stable version. I noticed that various versions such as Portable Firmware and multilingual version based on Version 1.61 came out. Firmware developers better than me did a great job. I will install Portable firmware based on Version 1.061 on another uBITX I have. 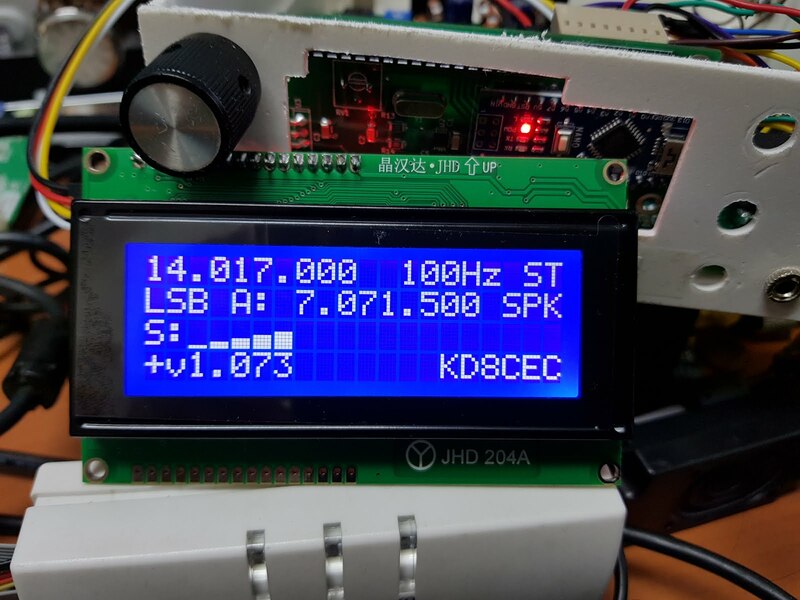 Since the release of firmware version 1.0, many users have been request support about 20x04 LCD, S-Meter, I2C-LCD, Real-clock for WSPR, change MCU, TTS(Text to Speach) and more. 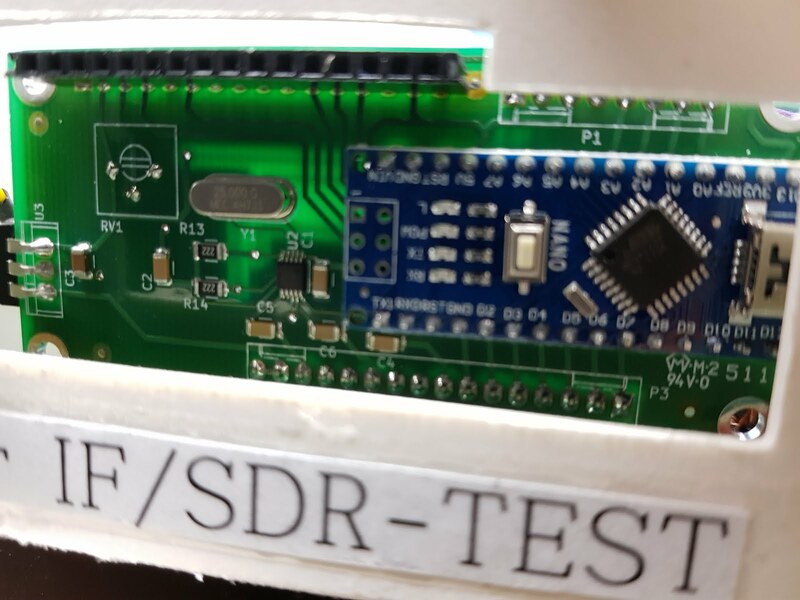 The concept up to Version 1.061 was firmware without any modifications to the hardware. These requests have been postponed and work started after Version 1.061 was stable. The standard of firmware is uBITX which is not modified. Since i was based on uBITX in the factory for firmware development, uBITX users need to activate the option for that function in uBITX Manager whenever they want to add the desired function to uBITX. Version 1.08 concept adds less than $ 10 hardware. I ordered the I2C LCD a long time ago for Learning, but it is still not shipping. So a few days ago I bought an I2C converter at my local shop. Version 1.070 Beta includes several blank files for various LCD support. The amazing developers of the uBITX group quickly made it possible to support I2C LCDs. I studied through their code and tested as soon as I bought an I2C LCD. I created a separate I2C LCD Library to reduce the size of the program and included it in the existing Tiny LCD Library. For these reasons, files have been renamed, deleted, and added since version 1.70Beta. So I did not release 1.072 Beta until the files were cleaned up to prevent the inconvenience of users using the source code. As the test progresses, it will be changed version number to 1.073 Beta and will be released soon. My guess is that Version 1.08 will be the final version with some Extneded hardware support added in Version 1.061. 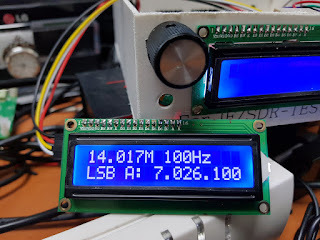 If you need additional hardware such as a different LCD, SDR, Extended Switch (Button) or S-Meter, you can use 1.08. If you are using the default uBITX you will not necessarily need to upgrade to Version 1.08. In this background, I gave some funny features in 1.073. One of them is various LCD support. 1-1. 16x02 Parallel LCD - It is the LCD equipped with uBITX. All functions are based on uBITX factory shipment status. 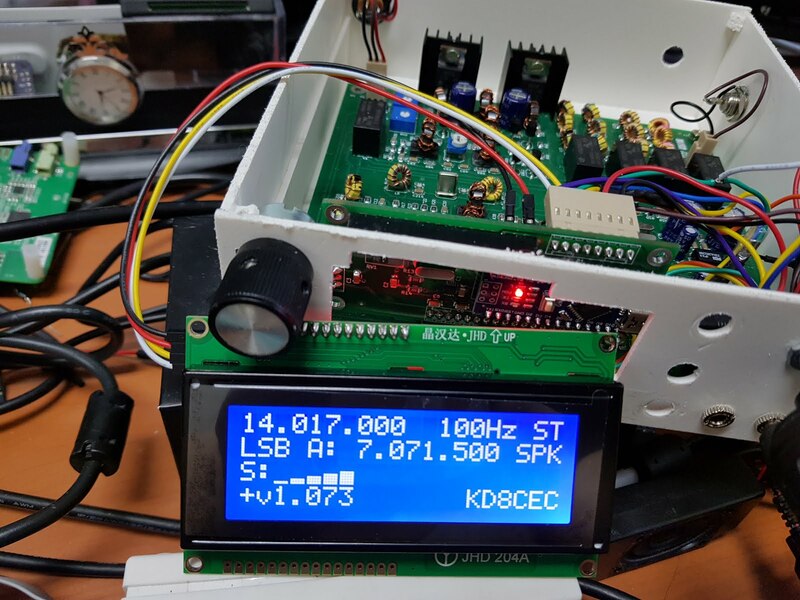 uBITX Firmware CEC Version supports the basic LCD as the first priority. The suffix of the compiled hex file is _16P. 1-2. 16x02 I2C LCD - It is an I2C 16x02 LCD that sells for less than $ 3 on ebay or aliexpress. 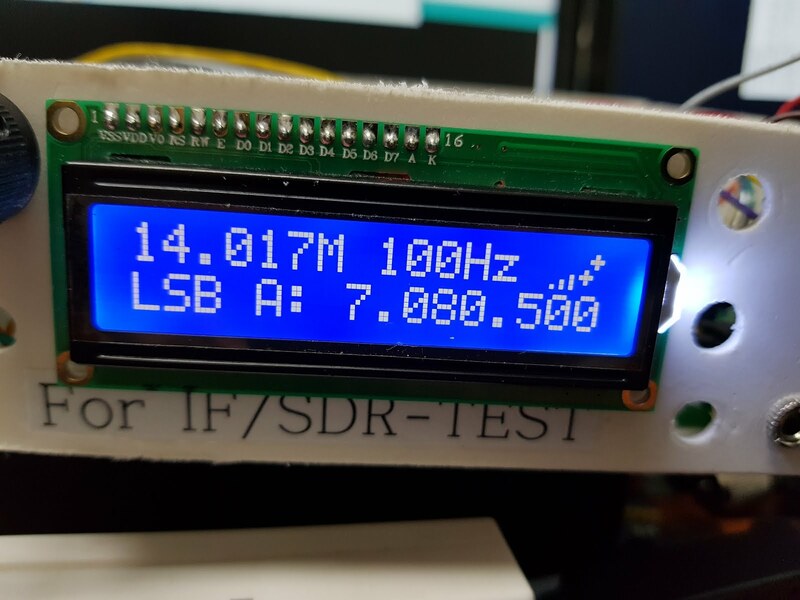 I bought a conversion converter for less than $ 1 and installed it on an existing LCD. 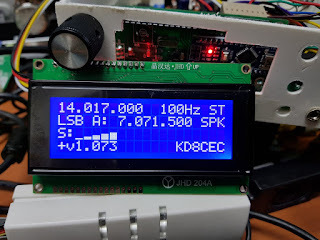 How to install I2C LCD is explained below. The suffix of the compiled hex file is _16I. 1-3. 20x04 Parallel LCD - A commonly used 20x04 LCD. It is highly recommended. I have now seen why users have continually requested a 20x04 LCD. A 20x04 LCD can be purchased for around $ 3. You can see big screen at low price. The suffix of the compiled hex file is _20P. 1-4. 20x04 I2C LCD - It is similar to 16x02 I2C LCD. Only Size has grown. A 20x04 LCD can be purchased for around $ 3. The suffix of the compiled hex file is _20I. I've made it for low case users. I do not know if it's usable, but I've implemented it for experimental purposes. I2C devices allow communication ports to be shared, allowing 16x02 LCDs to connect to each other without waste of PINs. 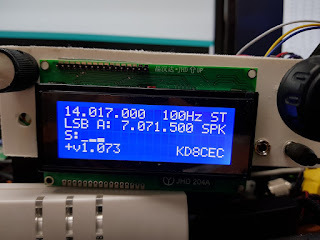 I did not have a spare LCD and connected the VFD. Please understand. Because of this, the release of Version 1.073 (Beta) is delayed one day. The suffix of the compiled hex file is _16D. When purchasing uBITX, remove the included 16x02 LCD and equip it in the same place. Just be careful about one. Before mounting, make sure that the pin arrangement of the purchased LCD is compatible with the LCD mounted on the uBITX. Most LCDs are compatible but sometimes there is a +5V pin. 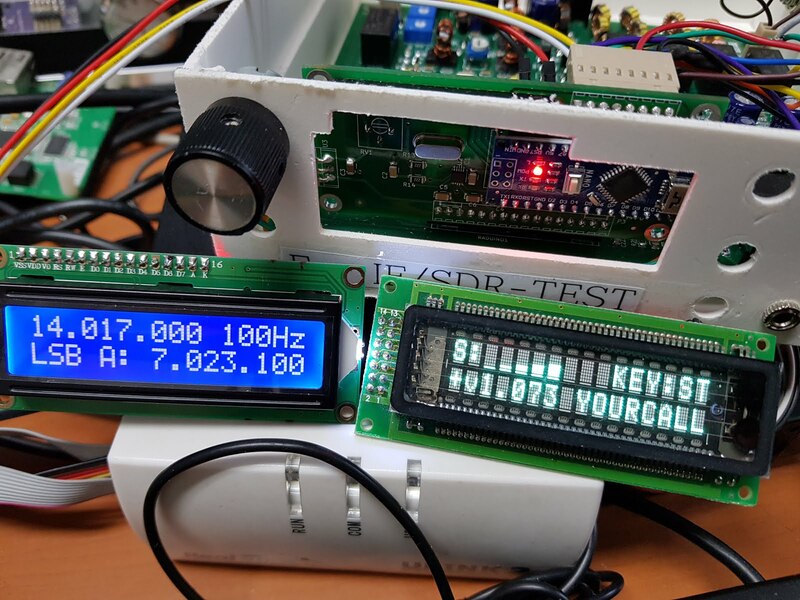 LCD mounted on uBITX is 1: GND, 2: + 5V, 3: Adjust. But do not worry. Most character LCDs are in GND, VCC order and are compatible with uBITX. 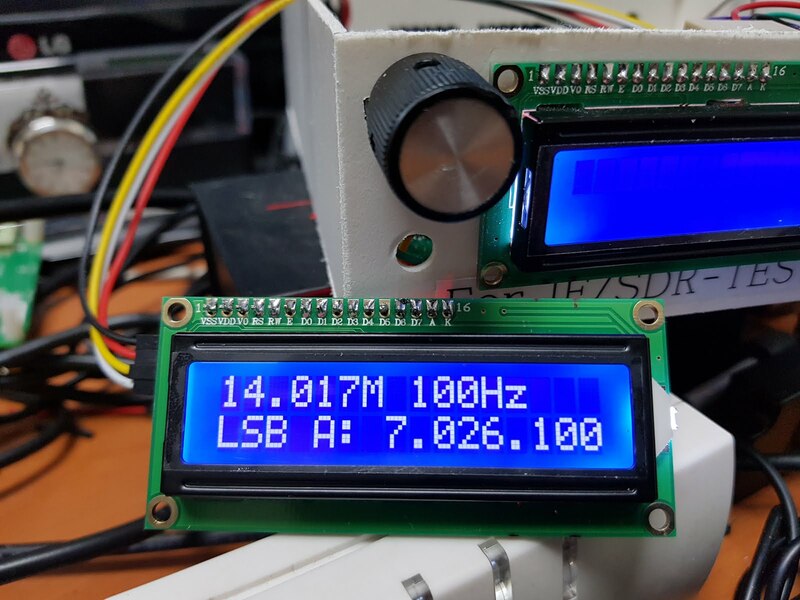 The 20x04 LCD can also use the 16x02 firmware. There will be empty space, but there is no problem in using it. 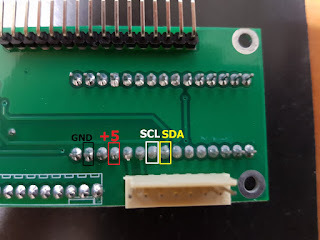 Connect GND, + 5V, SCL, and SDA wires to the Arduino Nano. I installed the pins because I had to replace the LCD every test. 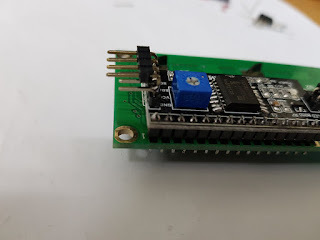 Connect the line to the I2C conversion converter. Note that SCL and SDA positions are opposite to Arduino. The I2C device has its own address. Most commercial I2C LCDs consist of 0x3F or 0x27. You can change the address using the jumper on the I2C conversion converter. Anyway, I set the Default address to 0x3F. 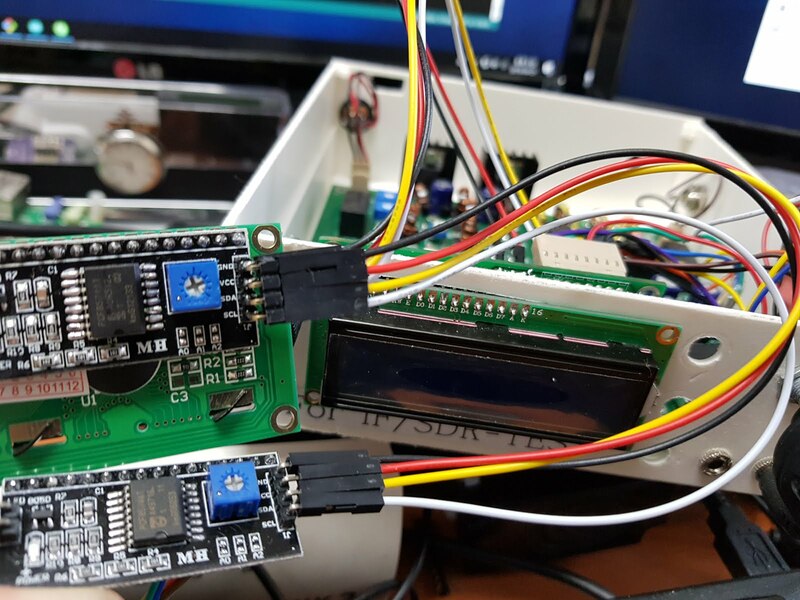 Do not worry if the address of your purchased I2C LCD is not 0x3F, you can change the I2C address in uBITX Manager. 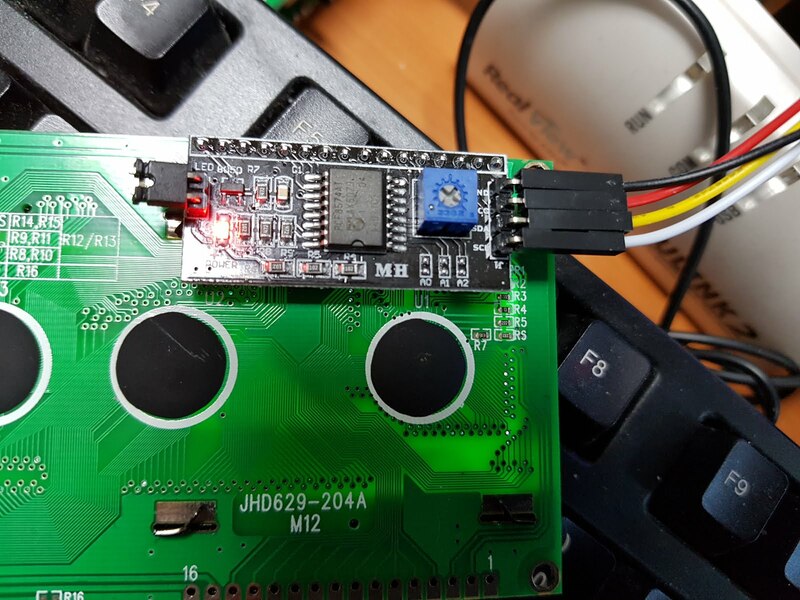 In uBITX Manager, enter your I2C LCD address in the Master I2C LCD input field. After saving to uBITX and rebooting, the characters will appear on your I2C LCD. This setting is the same for both 16x02 and 20x04. Only the size is different. 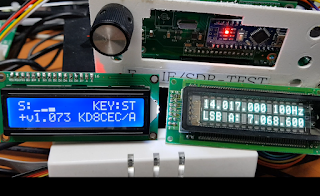 The following video shows an example of changing the address of I2C in uBITX Manager and selecting the LCD to use. 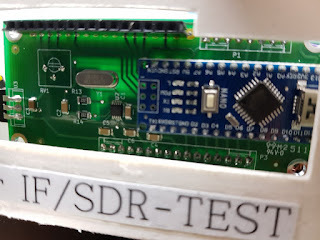 First, I2C Dual LCD connection is the same as above 3. Just connect one more I2C LCD. GND, + 5V, SCL, and SDA can be connected together in parallel. 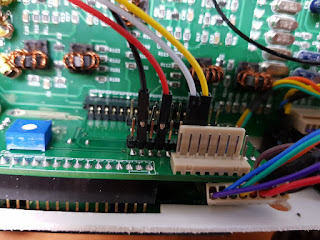 I soldered to the pins of the I2C LCD and connected them in parallel as shown below. 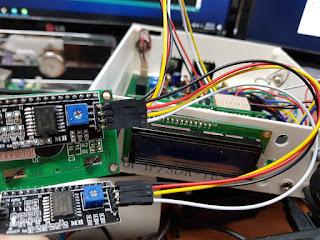 Below are the two I2C LCDs connected together. Note that the two I2C LCDs must have different addresses. The setting method is similar to the above 4. The only difference is that you enter one more address value. Enter the I2C address of the LCD to be used as the master. 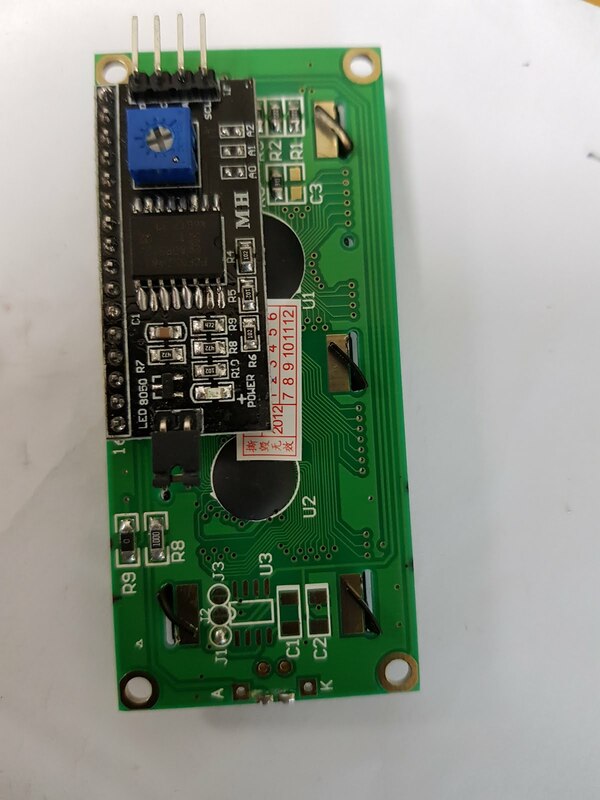 Enter the I2C address of the LCD to be used as the second. In my case, the I2C address of the Blue LCD is 0x27 and the VFD is 0x3F. You can set Master and Second in uBITX Manager as above. The following video is an example of setting Dual LCD in uBITX Manager. I guess the time has come to redesign the plugin module which holds the Display+uC+Si5351 , expanding the scope of more feature deployment. I am always looking forward to your work. I want to make my own uBITX someday like you. 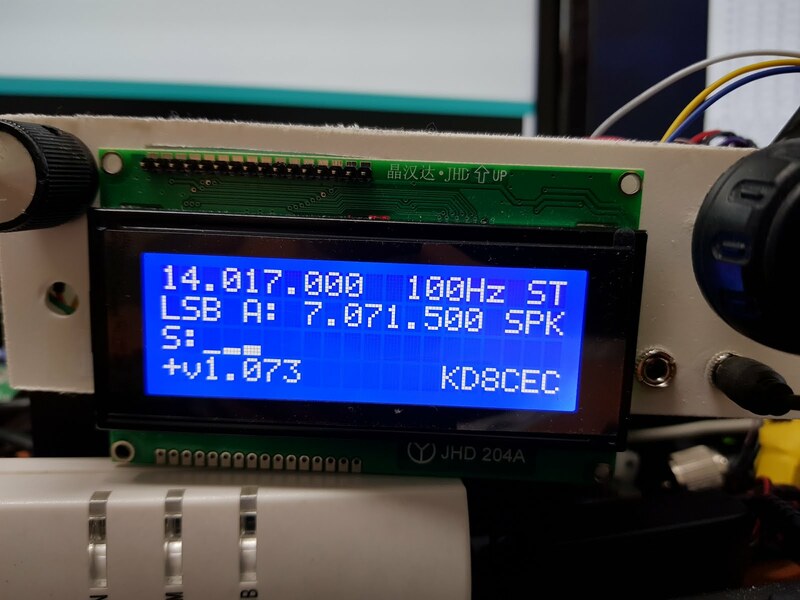 Can you also consider the use of a Nextion Display, can really take the load off the Arduino Nano with some impressive display. I struggled to remember the name of the Nextion Display. Thank you. Immediately after revealing the uBITX firmware, someone had talked about Nextion Display. I did a search on Google a few days ago to find the name. "font embedded graphic display", "built in font graphic lcd" ... more.. I found the name I forgot about today. I'll first check if the price and the remaining program space are controllable. uBITX Firmware I heard about Nextion LCD when it was first released. First of all, let me check the price. And we will have to consider whether to support nextion LCD afterwards. Check the Nextion group on Facebook for good info on it. Did you get my earlier note? Nextion LCD is not cheap, but I am waiting to buy and ship anyway. Thank you for good information. I also joined the Nextion group. uBITX Manager changed to Version 1.04 and released today.